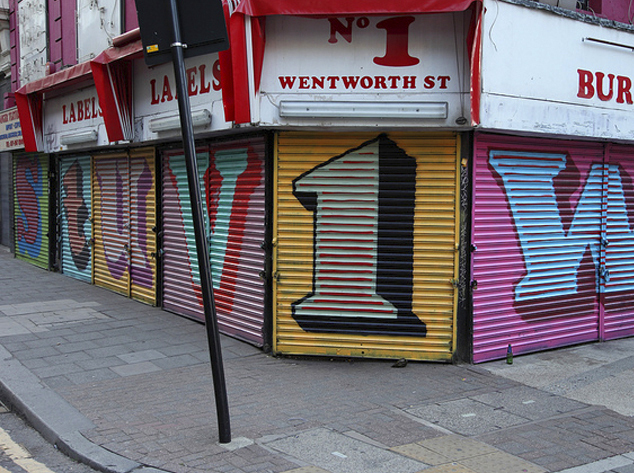 “Alphabet Street” is possibly the most famoust work of London based artist Eine. He painted shop fronts and murals in his distinct bright colors and larger than life typography in Middlesex Street. Times magazine has described it as “a street now internationally recognized as a living piece of art”. Eine has perpetuated his style over the years to make it his own. His artwork now shines in multiple parts of the world, both outdoors an indoors.